Podcast: Listen to Colin Gunderson speak with former Dodger knuckleballer Tom Candiotti (Link Here). Via ESPN; "Yasiel Puig won't be traded to unknown team that claimed him." 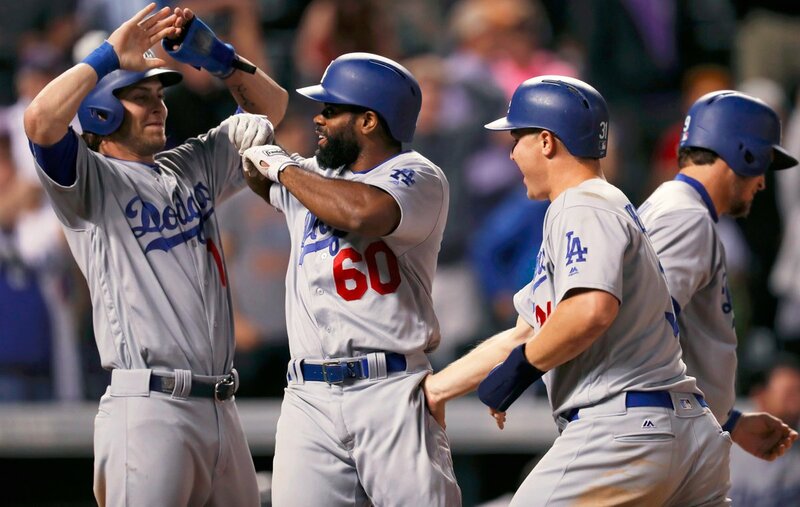 The unknown team that claimed Los Angeles Dodgers outfielder Yasiel Puig on revocable waivers had more interest in blocking him from going to another team than sincere interest in trading for him, a league source told ESPN's Jim Bowden. Via Tracy Ringolsby at MLB.com; "Has Puig changed? Dodgers will find out soon: Club will hold closed-door meeting with him before deciding whether to call him up." "The conversations we had with him at the beginning of August really resonated with him,'' said Friedman. "I think there's been a very conscious effort to listen to what was said, and apply it to his daily work. The reports from [Oklahoma City manager Bill] Haselman have been really good. "I was there a couple weeks ago, and it's obviously a short blip of time, but he's done everything we've asked in this process." Awesome! Via Eric Nusbaum at Vice Sports; "With a Little Help from His Friends: The Story Behind Baseball Announcer Vin Scully's Stories." Instead of an on-air partner, Scully relies on two silent men in the booth beside him: stage manager Boyd Robertson, and camera operator Rob Menschel, who also occasionally directs. Robertson and Menschel have worked with Scully on Dodger broadcasts since 1989. When the three of them are together, the booth has the feel of a family business—respect and professionalism underlined with nonverbal communication and easy humor. Facing home plate in the Dodger Stadium press box, Scully sits on the left side of the booth, Robertson beside him in the middle, and Menschel behind the camera to the right. "His job description and my job description have nothing to do with what we actually do," Menschel told VICE Sports before a recent home game. Rather, he and Robertson have evolved into a single organ devoted to supporting Scully through his broadcasts. They arrive at the park before he does and prepare the booth for his arrival. They are his research team, his partners, and his stand-ins for the listeners he is addressing at home. They are also his friends. Via Gregory Orfalea at the Atlantic; "The Rare Vin Scully: At 88, the legendary baseball announcer is marking his 67th and final season with the Los Angeles Dodgers. His contribution to the sport is harder to quantify." 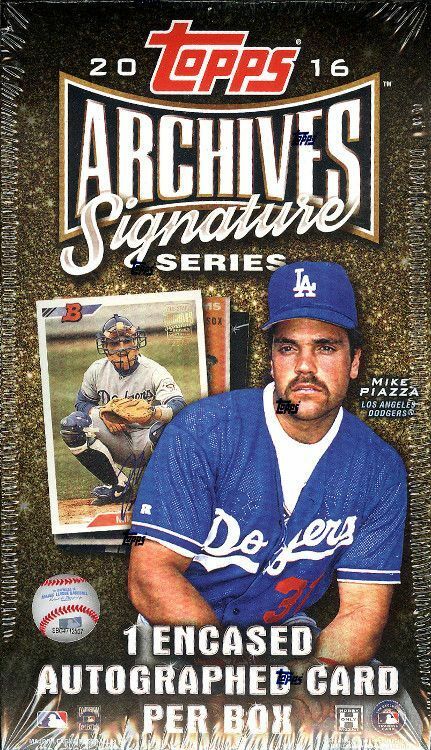 ICYMI: Topps officially released their 2016 Archives Signature Series boxes, and as you can see in the pic on the right it features newly minted Hall of Famer Mike Piazza on the box as a Dodger. This is not your traditional card set. Instead, it features only older Topps buyback cards that have been signed and numbered by the respective player. I hope to have a checklist of all available Dodgers soon, so stay tuned. Via the Tulsa Drillers; "De Jong, Calhoun and Verdugo Receive Honors from the Texas League: De Jong Named TL Pitcher of the Year." The Texas League announced its End of Year All-Star Team today, and the Tulsa Drillers were well represented. Heading the honorees was Chase De Jong, who was named the TL's Pitcher of the Year. Outfielder Alex Verdugo and second baseman Willie Calhoun were also named to the elite squad. Via Bob Nightengale at USA Today; "Dodgers' Chase Utley loses bet to Corey Seager, dyes his hair." Night Owl Cards takes a look at his favorite Hideo Nomo insert Baseball cards (Link Here). Most of what he show are cards I've never seen before. Nomo had became a hobby favorite at about the time I was finishing up college, so I spent most of my time trying to figure out what I was going to do with my life. A return to collecting was still a few years away.